Cottonwood borers attack trees mostly at the base or below the ground line, sometimes completely girdling the tree. Eggs are Laid in August and September. The Nymph Stage Looks like the adults but have no wings and are very active. The Adults are 1 – 1 1/2 in., shiny black, with markings of dense white pubescence forming a design; antennae extends three segments beyond apexes of elytra in males, and just beyond them in females. They are black with lines of cream-colored hair forming irregular black patches. Larvae are seldom seen. 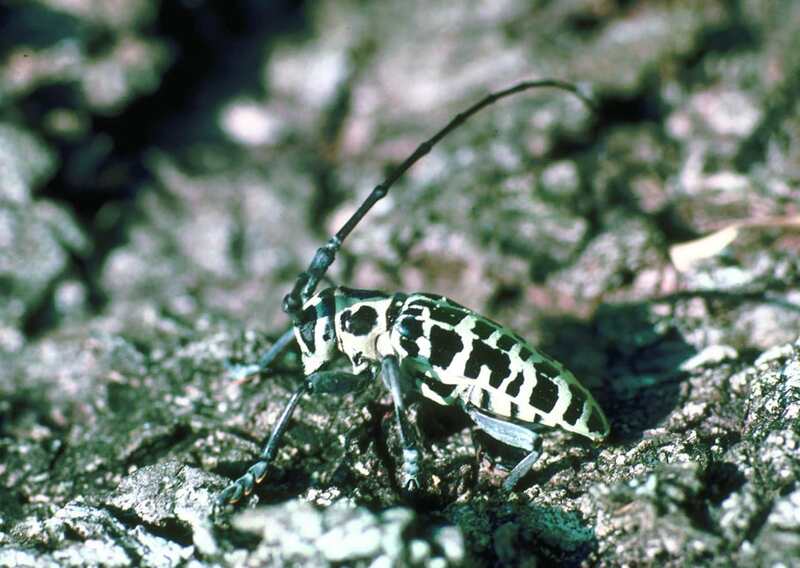 Cottonwood borers are found on Cottonwood, poplar, aspen, willows and ranges throughout the eastern Unites States, but highest populations and greatest damage occur in the south. Extensive mining of bark and cambium occurs, sometimes girdling the stems or roots of young trees. They tunnels through sapwood and into heartwood, filled with frass. Light brown, fibrous frass is sometimes ejected from bark openings at /or slightly above the ground line, accumulating in piles at the base of the tree. The root collar and roots of infested trees may be riddled by larval tunnels. The adults appear in mid-summer. After feeding briefly, they descend to the bases of host trees where the female deposits her eggs in small pits gnawed in the bark. Eggs hatch in 16 to 18 days. The larvae bore downward in the inner bark, entering a large root by autumn. Pupation occurs in the gallery from April to June and lasts about 3 weeks. The new adults chew exit holes through the sides of the pupal chambers and emerge through the soil. Some larvae complete development in 1 year, while others require 2 years.